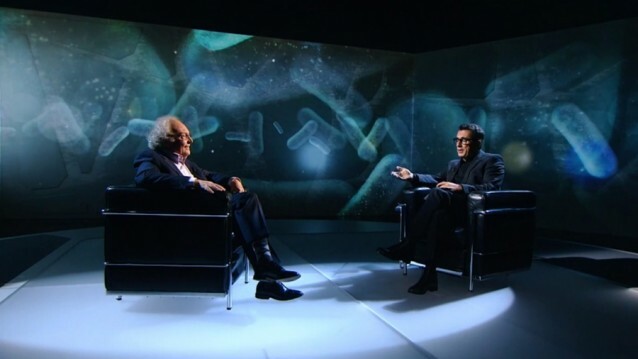 “In 2011, TV3 produced two very special interviews featuring the scientist and broadcaster Eduard Punset and the presenter and humourist Andreu Buenafuente. 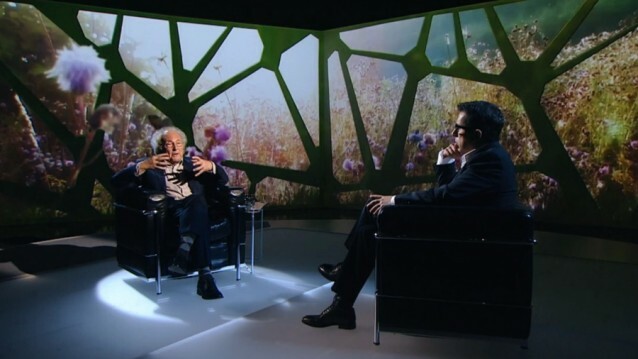 The programmes, which generated considerable expectation and required a significant investment, consisted of conversations between Punset and Buenafuente about a range of issues concerning everyday life set against a video mapping projection of almost 100 m2. 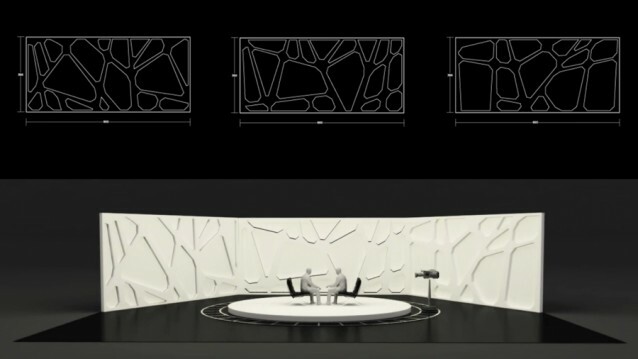 Tigrelab was chosen to develop the contents of the backdrop, an audiovisual “wall” 24 metres wide and 3.5 metres high. This reactive and continuously changing scene allowed the two men to continue to talk comfortably whilst they were taken from place to place…from a modernist library, to a New York building, to being surrounded by a futurist mesh created using images of codes. Words like love, city, brain, future formed the basis of the production that was accompanied by live conversation. A total of 20 different spaces were created. 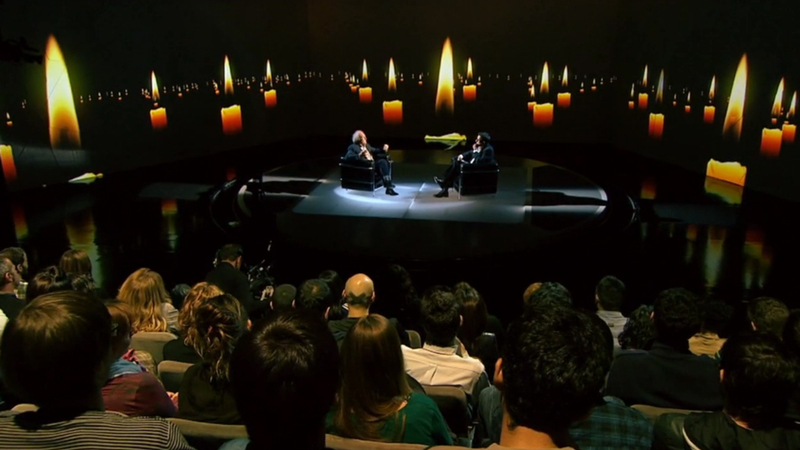 The programme was recorded in front of a studio audience for subsequent broadcast, allowing Buenafuente and Punset to talk freely whilst the producer “transported” them to different scenes based on where their conversation took them. Tigrelab proposed an audio-reactive backdrop developed by WeLoveCode using Processing. 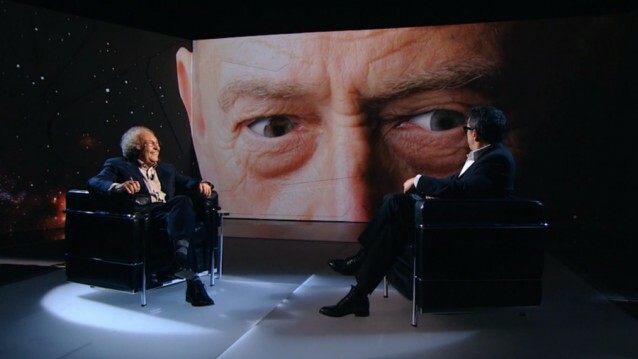 The system was reactive, allowing for the images to change depending on what was being said. This broke new ground in the field of interactive set design for television. The image was divided into two parts that were connected to left-right stereo audio, one side for each of the participants. The technical department created the montage for the projection and management of the video mapping using three Barco FLM 20K HD projectors and the WatchOut 5 program, offering considerable flexibility to the producer. Check out the official montage down at the bottom of the page! Enjoy!